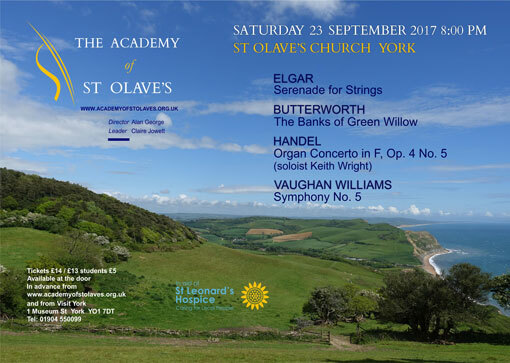 This lovely programme of English music on 23rd September 2017 is also raising funds for St Leonard’s Hospice, York’s local hospice caring for local people. In this article, the orchestra’s former Musical Director, John Hastie, guides us through a concert featuring some of his favourite English music. This is a lovely programme by this dedicated group of musicians, one after my own heart! Elgar’s Serenade for Strings is a particular favourite of mine, a piece I directed two or three times during my twelve years with this orchestra, as is George Butterworth’s The Banks of Green Willow which I directed twice with great joy. George Butterworth is often regarded as a Yorkshire composer. He spent time in York as his father eventually became chairman of the North Eastern Railway. 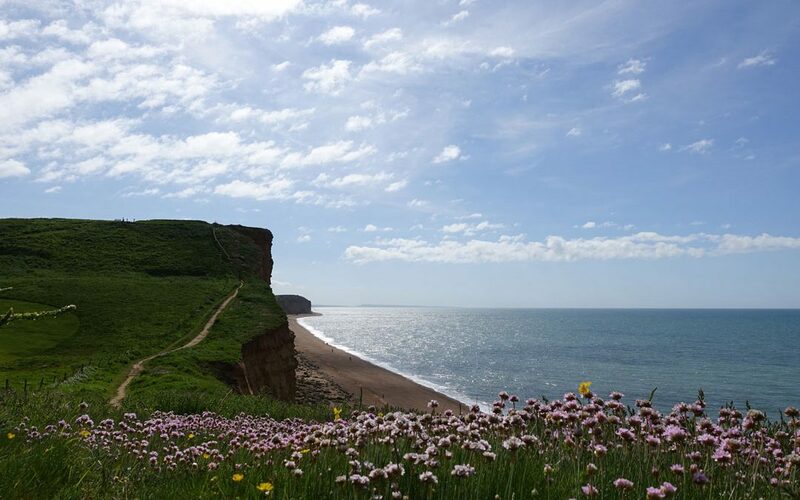 He was one of several very promising young composers – much involved with Ralph Vaughan Williams in folk-song collecting in the years before the First World War – who perished during the conflict, for him during the first battle of the Somme. This piece is a little jewel and it is poignant to realise that he destroyed a quantity of his works before he went to the front line. We must be glad that he spared this piece. The Handel Organ Concerto in F is another I remember directing when Geoffrey Coffin was the soloist. Geoffrey later was to rebuild the organ of St Olave’s and, during the reconstruction, I asked if a MIDI connection could be installed, allowing for a single keyboard from which to play the instrument. It was done! 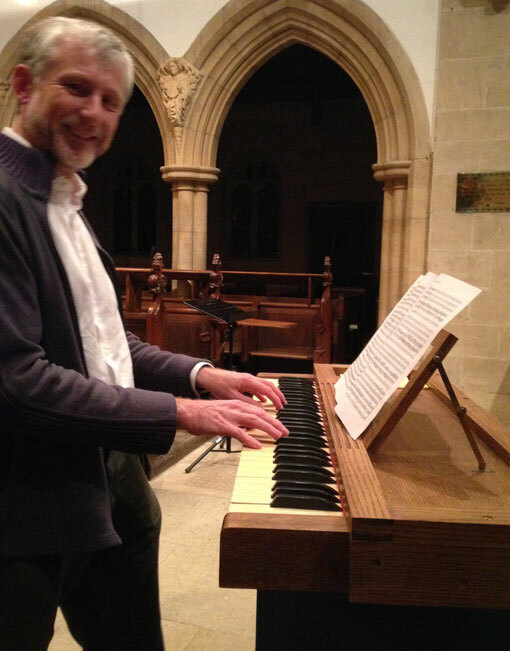 As a result, Keith Wright will play the concerto in full view and he will be better able to judge to balance of sound between the organ and the strings. This facility was of great use in my time as Director of Music at St Olave’s Church in playing and directing the verse anthems of Byrd and Gibbons as well as music from the Restoration. Symphony No.5 by Ralph Vaughan Williams I was never allowed to direct! I am so pleased Alan George has overcome whatever objections were raised in my day as Musical Director, for it is a great favourite of mine and I much look forward to hearing it. 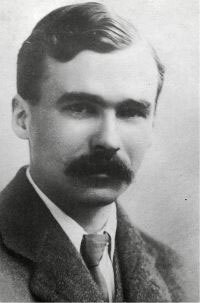 It sits well with George Butterworth in the programme, for Butterworth helped to reconstruct the full score of Vaughan Williams’ A London Symphony from orchestral parts. The full score had been sent to Germany shortly before the outbreak of hostilities in 1914 and was lost. A London Symphony is dedicated to Butterworth. Symphony No.5 by Vaughan Williams is dedicated to Jean Sibelius, whose work Vaughan Williams much admired. 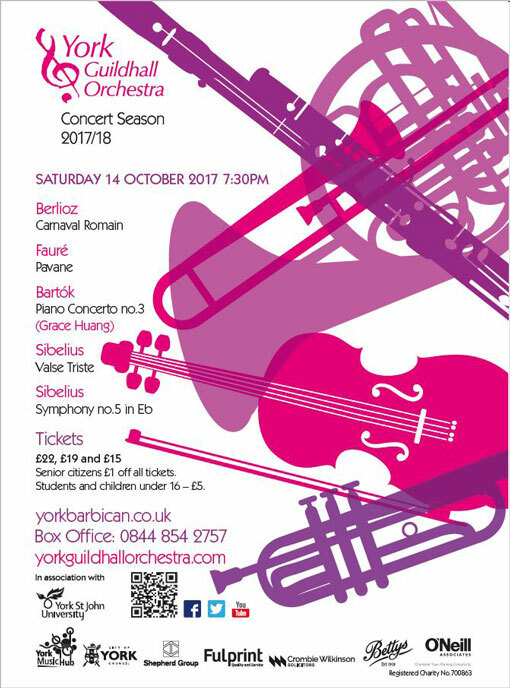 I mention this as another orchestra with which I have had some involvement, York Guildhall Orchestra, is currently working through all the Sibelius symphonies and will shortly be performing No.5. Do go and hear it! St Leonard’s Hospice , an independent charity providing specialist palliative care and support for local people with life limiting illnesses. Why not come along to St. Olave’s Church for this concert of lovely English music? Tickets for our concert on Saturday 23 September can be purchased in advance from our website, or from Visit York, 1 Museum Street, York. Alternatively, just come along to the concert at St Olave’s Church between 7 and 8 pm and you will be able to pay at the door. 13 Winds including a Double Bass!